Home » Posts » Anxiety and Depression – What’s the Connection? Anxiety and depression don’t always go hand in hand but when a person experiences severe anxiety or stress his risk of being diagnosed with depression increases. Similarly, studies show that people who are diagnosed with depression are more likely to have an anxiety disorder than someone who isn’t in a depressive state. On the surface it might seem that there wouldn’t be a connection between these two disorders since so many people experience stress and anxiety as a normal part of their lives but people who suffer from either of these medical conditions find it affects their enjoyment of life on a constant or near-constant basis. Despite the well meaning advice of friends and family, the fact is that most people who have anxiety disorder and/or depression can’t ‘get over it,’ ‘just not worry’ or ‘just do something to make you feel better’ without some sort of treatment . The reasons why someone who is anxious or stressed about something – for example, a work or personal matter, or a health issue – may find themselves in a depressed place could be due to a variety of causes. Often when the level of anxiety increases to the point the person is overwhelmed and feels a loss of control over a particular situation depression can develop. Understanding the interplay between both conditions and how each is directly related to the other is critical to discovering the best plan of attack to feel better since if left untreated this anxiety can manifest itself into a medical disorder that becomes chronic in nature. OCD is a mental health disorder where a person’s anxiety about a certain event or outcome most often comes out in a recurrent, extreme manner. For example, we wash our hands to get rid of germs that may be harmful to us. Someone with OCD may wash his or her hands hundreds of times throughout the day because of the fear of germs. People with OCD generally have a great deal of anxiety because they know what they are doing is atypical but feel compelled to act in an obsessive manner which in turn makes them more anxious. A panic attack is one of the symptoms of another anxiety disorder called Panic Disorder. A panic attack can occur at any time and in a person of any age. What makes a panic attack so disturbing and creates even more anxiety in those who suffer from this disorder is that these attacks usually come out of the blue. This makes the person even more anxious about the possibility of having another one. If left untreated, this disorder can lead to the person shutting themselves in their home (agoraphobia) and depression as he or she becomes more withdrawn from friends, family and social activities. People suffer from this stress disorder have witnessed or were involved in a traumatic event that involved bodily harm or the threat of bodily harm or death. Research shows that when some people see or are involved in such a potentially life-threatening condition their stress levels increase to such an extent that the way their body handles stress from then on is altered. Those who have social anxiety disorder are extremely fearful of social interactions. They are afraid they are going to humiliate themselves in front of others by saying or doing the ‘wrong’ thing. Some people with this disorder become terrified when faced with specific social situations – for example, dating – whereas, others with this disorder are afraid of general situations – for instance, meeting anyone new in any situation. While not technically an anxiety disorder, there are some related disorders such as bipolar disorder and dysthymia which are also strongly linked to depression. Someone with bipolar disorder or one of the other mood disorders experiences the same symptoms of depression as those with anxiety disorders. 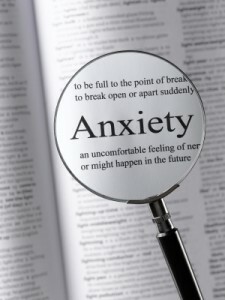 Regardless of what type of anxiety a person suffers from the condition can often lead to a depressed state. The person with an anxiety disorder often feels ‘abnormal’ and alone. Since a person’s mood can often manifest itself into physical symptoms, it isn’t unusual for a person with an anxiety disorder to have specific depression symptoms. These symptoms of depression may include but are not limited to low mood level or feelings of sadness, lack of energy, feelings of low-self esteem and self-worth, reduced physical activity, poor judgment, and thoughts of suicide It can also manifest itself with a change in sleep patterns by either sleeping a lot more or having trouble going to sleep. Not every person will experience the same or all symptoms. Some may have a couple of symptoms while others may have more. Each person’s experience is different. Help is definitely possible for anyone suffering from anxiety and depression. No one is ‘doomed’ to live a life filled with either of these stress related illnesses. There are screening tools and tests available to provide assistance with determining if an anxiety disorder exists and to determine the severity level. For mild forms of anxiety and depression, self treatment may be possible through home remedies. If either condition is present in mild form, exercise has been shown to help ease depression and sometimes eases symptoms associated with anxiety. It can be a fast way to reduce stress and help promote a different view of what can sometimes seem like a hopeless situation to those in a depressive state. Alcohol should be avoided while during a depressed state or a state of anxiety. If home remedies are tried for several months yet do not produce the desired results it is recommended that a person seek outside help for the affective disorder. For moderate to severe levels of these two conditions getting outside help is strongly recommended – for example, help via a support group, counselor or medical professional is recommended. For those with children or teens suffering from a depressive disorder or one of the anxiety-related disorders, a school counselor may be equipped to answer questions or provide information that can be of assistance. The goal of the treatment will be the same – to reduce stress and ease the anxiety by addressing the root of the problem. To this end, it is important to find the reason behind the anxiety. For many people, cognitive behavioral therapy treatment methods tend to produce the best, most long lasting results as it can help uncover the root of the anxiety a person experiences and neutralize it. If this course of clinical action is decided upon, check with medical sources in your own area to find a therapist as there are special therapists that focus specifically on treating generalized anxiety disorder conditions through behavior therapy. It provides a safe site to find help and start to learn tips that can help a person manage his or her anxiety disorder and prevent the disorder from getting worse. For those who are diagnosed with a major form of an anxiety disorder, medicine may be the answer. Psychiatry may be necessary at which time medication may be given. If both depression and anxiety are present then it is often advised to treat depression first before addressing the anxiety disorder as it greatly increases the chances of a favorable outcome. For example, if a person undertakes certain steps to better sleep and an increase of his mood level, he is more apt to have the energy needed to work on resolving his anxiety disorder which in turn will lessen the likelihood of his falling back into a depressed state. Please note: anxiety and depression should be taken seriously. It can cause a high degree of pain and mental anguish. It is important to get help immediately if you suspect that you or a loved one is at risk of suicide. Can Anxiety Cause Depression ?